DIY wreath with a simple twist – made square, instead of round, by adjusting the branches, then given a Victorian feel by the addition of a porcelain doll ornament. Quick and easy to make yourself. This wreath is very easy and takes very little time to assemble. 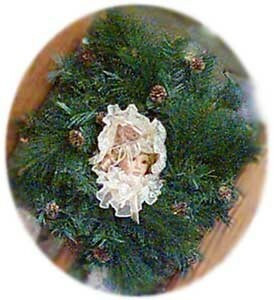 Though this wreath appears to be square, it is a round wreath that I reshaped. This is done simply by moving the sprigs of greenery to the desired shape. Bending the actual frame is very difficult and most wreaths will allow the shape change with altering only the branches. Because this wreath is so plain, I wanted something a little different. Therefore, the square appearance. Begin by attaching pine cones randomly to the wreath. Attach by wrapping a strand of wire around the pine cone, pulling the wire within the cone to hide and wire to the wreath. Attach a piece of wire to either the hanger that is attached to your doll face or attach to an appropriate place on the ornament and secure the face to the center of your wreath. That’s all there is to this very beautiful DIY wreath: simple, easy-to-do, but very effective.